Goalkeeper Nick Pope harbours dreams of going all the way with Burnley in the FA Cup and playing a part of the finale at Wembley Stadium. The 24-year-old caught the bug for the country’s most esteemed knockout competition as a teenager, just short of a decade ago, when watching Chelsea lift the trophy on television as goals from Roberto Di Matteo and Eddie Newton secured a 2-0 win over Middlesbrough. The former Charlton Athletic stopper made his second start for the Clarets in the third round tie against Sunderland at the Stadium of Light, adding to the clean sheet he earned over 90 minutes of the EFL Cup game against Accrington Stanley earlier in the campaign. The stalemate in Wearside means the two teams will have to do it again, next week, as they battle it out for a place in the next round. “It was nice to get back out there,” he said. “It means the world. Obviously when you’re growing up you watch these games. “The FA Cup final is always the game that everybody watches every year. It’s a big finale at Wembley so to be involved in this competition is massive. It’s world renowned. “We looked solid over the 90 minutes and the lads in front of me did really well. It made me settle in early in the game which was really nice. Pope added: “I remember one of the first finals that I watched was when Di Matteo scored for Chelsea against Boro. “That’s the one that I can think furthest back to. From then you always get the bug as a kid and that just makes you thrive. 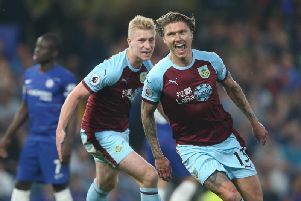 While Pope has been benefitting from the expertise that he surrounds himself with a Turf Moor - namely goalkeeping coach Billy Mercer and team-mates Tom Heaton and Paul Robinson - his development has also been aided by getting game time for Michael Jolley’s side in the Premier League Cup. The young Clarets are third in Group B after two games in the competition. “I just want to keep improving and at the moment the gym work is key for me. “I’m training day in day out so when I get the chance to play games I’ll try to play well and keep a clean sheet. I just want to progress.